Yes this is it! We have crossed the Rubicon and events in the world economy are now likely to unfold in a totally uncontrollable fashion. Clueless governments still don’t understand that it is their ruinous actions that have created a credit infested and bankrupt world. They will continue to prescribe the same remedy that caused the problem in the first place, namely more credit and more printed money. The consequences are clear; we will have hyperinflation, economic and human misery as well as social unrest. When will the world finally begin to understand that we have reached the point of no return and that “the voyage of their life is bound in shallows and in miseries” (Shakespeare, Julius Caesar). Sadly, we are probably not very far from that point. It is already starting to happen in many countries. The latest EU and IMF package of $ 1 TRILLION (Euro 750 billion) is yet another futile attempt by governments to abolish poverty by printing paper. Let’s be absolutely clear, this money does not exist and the EU governments are hoping by declaring such a large amount that they can con the Wolfpack speculators. At this point the EU has just picked a large round figure out of the air. But when their bluff is called by the Wolfpack and the next attack happens, EU governments will after initial huffing and puffing start printing unlimited amounts of paper. So the world is now on its road to ruin and there is no action, no leader and no new amount of printed money that can save the world or prevent a hyperinflationary depression. Never in history has the world been in a situation when virtually all industrialised countries are bankrupt. Therefore there is no precedent for what will happen in the next few years. What we can be quite certain about is that events will happen in a seemingly random pattern and that it will be impossible to forecast where the next crises will start. But although we will not be able to predict in what order events will take place, we can expect much of what is outlined below to happen. Already back in 2007 we warned about the very high risk of the CDS (credit default swap) market. This is now one of the primary instruments used by the Wolfpack (expression coined by the Swedish Finance Minister Borg). The Wolfpack, speculators with enormous fire power such as hedge funds and investment banks, use the CDS market to attack any weak financial sector, be it a country, a bank or a company. The combination of the leverage of the CDSs and the massive capital available to the Wolfpack makes it possible for them to bring down or badly maul whatever they attack. It was not the Wolfpack that caused the problem in for example Greece but they can bring down a weak victim quickly and profit immensely and immorally from it. There are so many weak potential victims that the Wolfpack can attack and they will start with the most vulnerable ones like, Portugal, Spain and Ireland etc. But when the time is right they will also attack the US and the UK. So in the coming year we will see country after country coming under attack from the Wolfback which will lead to acceleration in money printing and higher interest rates. Iceland – Ireland – Greece – Who is next? The EU support package of $ 1 trillion is supposed to be sufficient to protect the rest of Europe from another Greek tragedy. The dilemma with such a massive EU commitment is that no government expects to have to pay the money out. If they did the voters in the respective EU countries would throw out their government. Why should the German people, who are also having hard times, pay for the Greeks, Portuguese or the Spaniards, especially since these loans will never be paid back. Greece is bankrupt but is still taking on additional EU loans of € 140 billion. In addition, their austerity measures are supposed to bring the deficit down from 12% of GDP today to 3% in a few years time. But who can be so stupid as to lend to a bankrupt nation which will sink into the Ionian and Aegean Seas in the next few years. With massive cuts in government expenditure, with major falls in output, with unemployment rising fast, with tax revenues collapsing how can Greece possibly be expected to improve the economy and pay a high interest rate on their exploding debt? In addition, as long as they have the Euro they will be totally uncompetitive. So if they couldn’t manage their economy in the so called good times, it is absolutely guaranteed that they have no chance of surviving in bad times. So Greece will default and so will Portugal, Spain, Italy, France, the UK, the US and many more. But before that there will be the most colossal worldwide money printing exercise which would have used up most of the trees in the world but for electronic fiat money. So, if virtually bankrupt nations don’t cut their deficits, they will definitively go under and if they try to cut, they will also go under due to collapsing output and tax revenues and colossal debts. Thus whatever actions governments take or don’t take, they are damned. The table below shows debt as a percentage of GDP for various OECD countries. 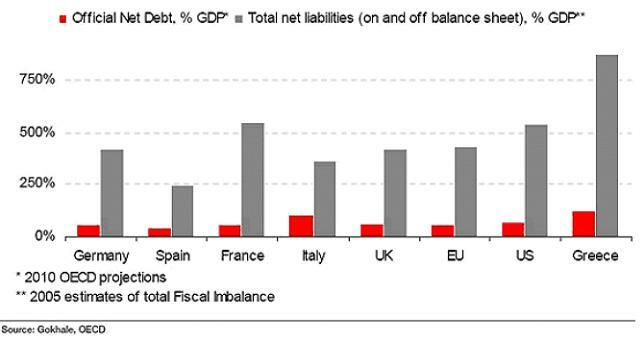 The official debts (in red) are massive and unlikely to ever be repaid in real money. Total debts (grey bars) include unfunded liabilities such as pensions and health care. Spain has the lowest total debt to GDP of 250%. Germany and the UK have around 400%, the US over 500% and Greece over 800% debt to GDP. These figures are absolutely astronomical and prove that most governments in the world will be totally incapable of repaying their debts or funding the pensions or medical care which they have committed to. It doesn’t matter however much governments cut expenditure or raise taxes, all these countries are insolvent and nothing can save them. Most governments still believe that deficit spending and money printing is the solution to all their problems. Because the world economy’s expansion in the last 100 years and particularly in the last 40 years has been primarily based on credit and not real growth, governments live under the false impression that money printing will work this time too. But we have reached the point when investors will no longer buy worthless government debt that will never be repaid with real money. We will first go through a period when governments issue and buy their own debt thus monetising the debt or print money. This will be the hyperinflationary phase. Thereafter the world will realise that none of the government debt and very little of the bank debt will ever be repaid. Credit will then implode and so will also the assets financed by credit. Eventually there will be a new monetary and financial system and the world will start afresh. The adjustment period will be very long and will involve economic and human misery, leading to social unrest and major political change. It will be a horrible experience for the world during this extended period of adjustment. But it will be like a forest fire that clears out the deadwood and creates the conditions for strong new growth. Once the new era starts it will therefore be from a very much lower level and individuals will be rewarded for hard work with little or no social security safety net. Credit will only be granted for sound capital investment projects, not for consumption or speculation. Ethical and moral values will return and the golden calf will not be worshipped. But before that, the period of readjustment will be very long and extremely difficult for the whole world. For several years we have predicted that hyperinflation is the most likely outcome of the economic predicament that the world is in. But it is unlikely to be a straightforward hyperinflationary period. Precious metals will be the primary beneficiaries of hyperinflation. Certain commodities, especially food and energy, will also go up in price. But most assets that have been financed by the credit boom will go down in real terms. This includes property, stocks and bonds. In hyperinflationary money these assets could still go up in price. If someone who earned $ 50,000 per annum in real money now earns $ 5 million in newly printed money, his house will probably also go up in nominal terms. But in real terms property prices will decline massively. There will be no credit available and interest rates will be very high, probably at least 15-20% so very few people will be able to buy a house. Hyperinflation will destroy many currencies so paper money will definitely reach its intrinsic value which is zero. Gold and silver will virtually be the only assets that will protect investors fully against the destruction of money. In our February newsletter “Sovereign Alchemy will Fail” we discussed the Sovereign Time Bomb and we are now experiencing the initial small explosions with Greece as the first victim. The $1 trillion EU/IMF rescue package was never intended to be more than a headline figure. EU governments were hoping that this would frighten the Wolfpack away. But so far this has failed. The Euro went up 4 cents when the package was announced but is now down to new lows again. How can anyone take a massive rescue package seriously when most of the countries making the commitments are bankrupt themselves? Spain and Italy have committed tens of billions each. And they are the ones that will be attacked by the Wolfpack next. This is the bankrupt saving the bankrupt. The IMF has no money but is dependent on its members of which the US is the biggest contributor. And they are bankrupt too. The UK, which is not in the Euro Zone and which has a worse budget deficit than Greece, contributed £15 billion. The new UK government is planning to cut a massive £ 6 billion of costs out of its next year’s budget which will bring major hardship. But as a last act, the outgoing labour government committed £15 billion which if paid out will never be repaid. The whole thing is a total farce. Governments commit trillions to rescue banks and sovereign states but cannot even make budget cuts of a few billion in their own countries. This shows that the world economy and the world financial system is being run by morons who only have their own self interest in mind and do not understand the consequences of their ruinous actions. When the $1 trillion EU rescue package was announced, the US simultaneously offered European banks dollar Swap facilities (dollar loans) of a minimum $500 billion but probably much more. In addition the US Fed also injected at least $500 billion into the US banking system. These actions make it clear the banking system is under tremendous strain similar to 2008. But this is just the beginning. Things will get a lot worse. In 2002 we advised investors to put up to 50% of their liquid assets into gold when the price was $300. To us it was crystal clear that the mountain of debts and derivatives would never be repaid with normal money but would be inflated away by money printing and this is what is now happening. The media are now talking about a bubble in gold and comparing to the 1980 top at $850. 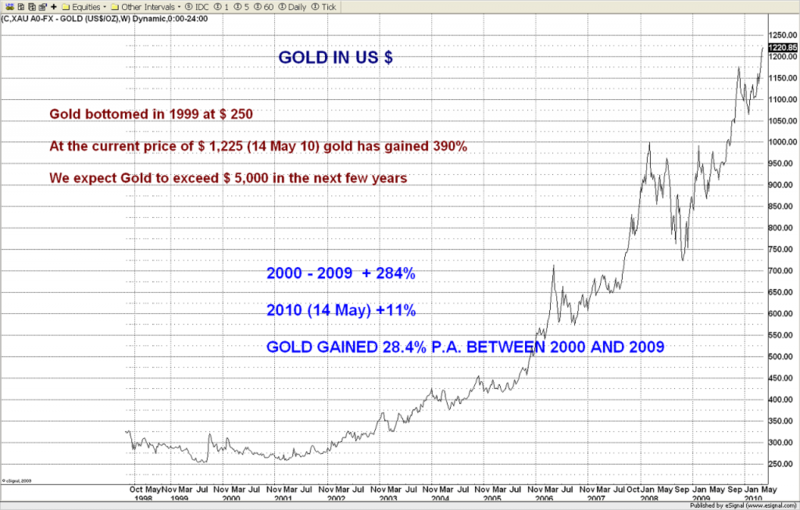 Let us be very clear, although gold has gone up 5 times since the 1999 bottom at $250, it is nowhere near its peak. Adjusted for real inflation (as per shadowstats.com) the 1980 gold peak in today’s prices corresponds to around $7,200 today. So gold could easily go up 6 times from the current price of $1,220 and still be within normal parameters. Gold production is going down. Neither Comex (the futures exchange), nor the bullion banks would be able to deliver more than a fraction of the physical gold for which they have outstanding commitments. Central banks and the IMF probably don’t hold even half of the 30,000 tons that they claim they have. Most likely, at least 15,000 tons (6 years gold production) have been sold to suppress the gold price. The precarious financial system will lead to a total distrust of paper gold including most of the ETFs which have no physical gold. 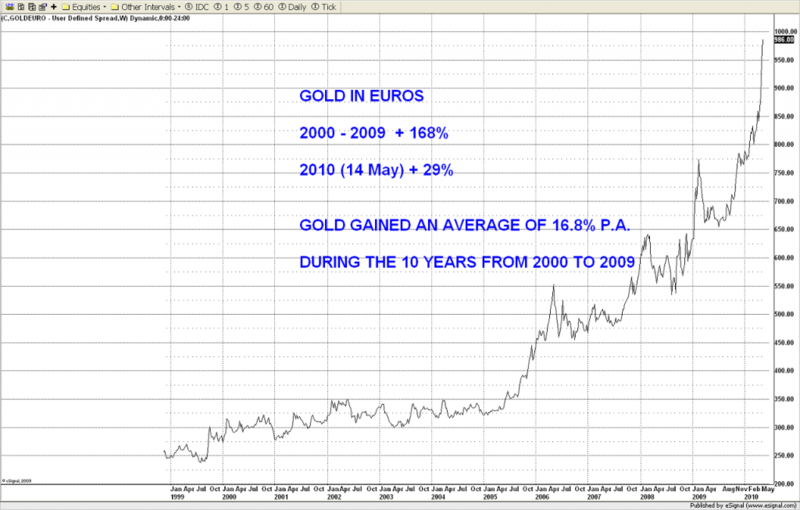 The four factors above will lead to the most massive surge in the gold price. There will be nowhere near sufficient gold to satisfy demand at current prices. 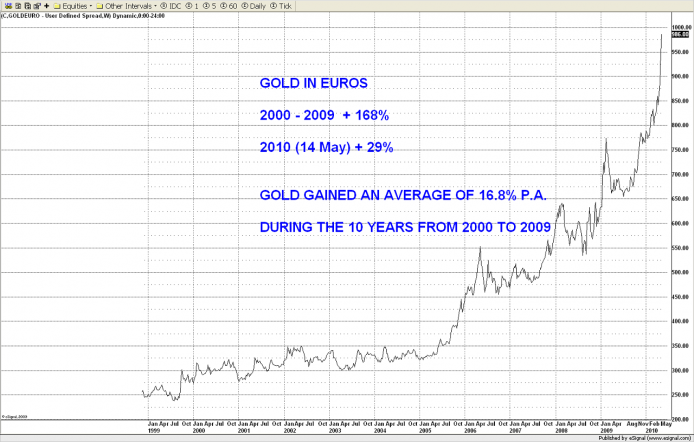 We had been expecting gold to start its acceleration in March 2010 and this is exactly what is happening. We expect the move to be relentless during most of this year with very few major corrections but with high volatility. Moves of $100 in one day could easily happen. So gold is likely to make a top in the next few years between $5,000 and $10,000. But if we get hyperinflation the price could go exponentially higher like in the Weimar Republic when gold reached DM 100 trillion per ounce in 1923. 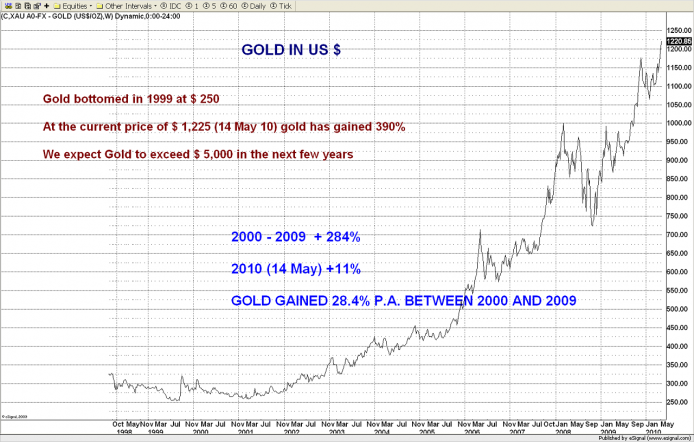 Will gold experience the same type of correction when is has peaked as happened after the 1980 peak? Probably not, because gold is likely to be a part of a new monetary system that will be created when the current one has collapsed. 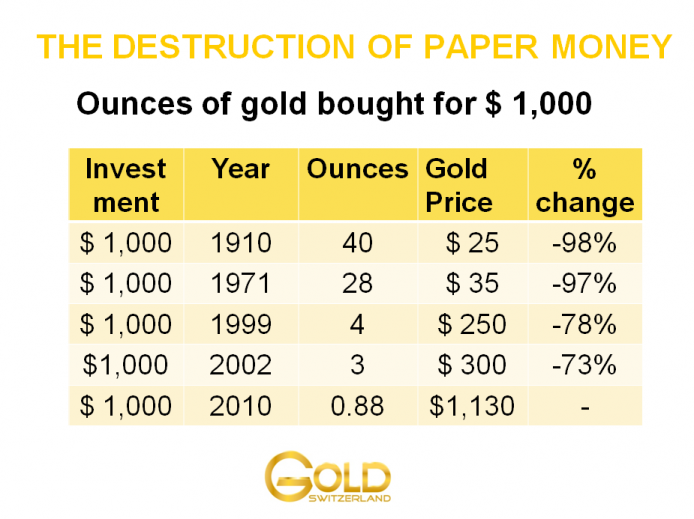 The table below illustrates the total destruction of paper money against gold in the last 100 years and shows how many ounces of gold that $1,000 bought at various times. In 1910, $1,000 bought 40 oz of gold at $25 per oz. Today in 2010, $1,000 buys 0.80 oz of gold at $1,230 per oz. This is a massive decline of 98% in the value of the dollar measured in real terms in the last 100 years. The next significant year is 1971 when Nixon abolished the convertibility of dollars to gold. It was this disastrous decision that opened the floodgates for the credit and money creation that we are experiencing currently. The dollar is down 97% since then. But even if we take more recent years, the purchasing power of the dollar measured in gold has declined catastrophically. Since the 1999 gold low, the dollar has declined by 80% against gold and since 2002 (when Matterhorn Asset Management recommended major gold investments) by 76%. Virtually all currencies show similar declines in value against gold in the last 100 years. This is the clearest evidence of governments and central banks defrauding their people of their hard earned money. Where will it end? It will end when the dollar and many other currencies reach their intrinsic value of ZERO. That time is not far away. Tagged The die is cast.